Marriage has sacred place in our roots and culture. We promise our life for someone whom we trust and choose to be lifelong companion. Here, trust has an important role to play as we endeavour to put our faith in someone for life. So, is it alright to make your vows with someone you don’t know and do you really know that someone? Well, these are the first thing that strikes parents. They would like to know whether they are making a good association with a respectful family or are there any secrets that are still to reveal. What will a wise person will do – engage with a family that he or she don’t know or make a smart choice of keeping trust alive for life by getting assurance about that particular person and his or her family? – First Indian Detective Agency can prove useful for all your Pre and post marriage concerns. This highly experienced private investigation agency take up a thorough investigation work about the person’s identity, his or her family background and many other relevant searches, and gives you room for taking an informed decision. Education profile: taking up university data to match the claimed degrees as declared by the subject in his or her matrimonial portfolio. Industry supervision: Collecting useful information about the subject’s work profile, salary and his or her reputation in the work domain. Social character check: Interviewing nearby social circle to get idea information about the daily routine and character of the person. Family Background investigation: Collecting useful data to get details about the family background of the subject. Financial Status: Getting monetary check on the subject to know financial wellness of the person and family. Suspicion of adultery check by the spouse: Doing adultery check on the spouse with the help of advanced equipments. Child Possession and Separation or Divorce cases: providing with evidence and information to support your case. Extra Marital affairs: Doing loyalty check on the spouse if extra marital affair are suspected. You can choose the services or club services as per your demand and get infroamtion that has potentially valuable for survival of your identity as an individual. In this plethora of choices, consumers get personalized assistance to the issue and provided with a dedicated team of intellectual detectives. Consumer can trust and rely on us as we have team of highly experienced and well equipped professionals to understand consumers’ issues related marriage. We undertake pre-matrimonial and post-matrimonial investigations both. 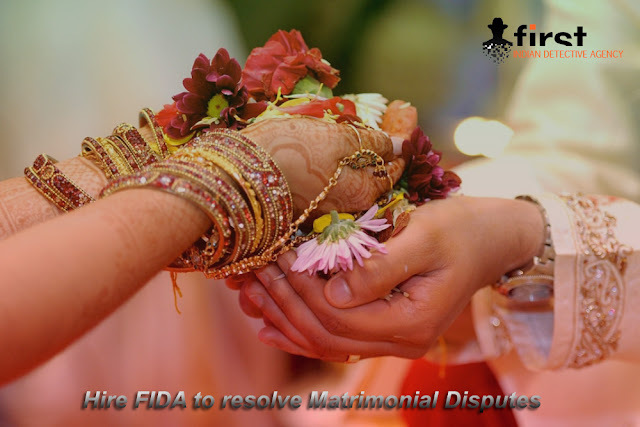 For more information and help on any matrimonial issue, feel free to get connected with our team of experts.